SynergEyes recently introduced UltraHealth FC in a limited release. The new lens is a second-generation hybrid lens with SoftCushion™ comfort technology indicated for post-surgical, refractive error and trauma. UltraHealth FC is designed to give your post-refractive patients and patients with oblate corneal surfaces enhanced tear exchange, lens movement with an unprecedented combination of vision, and comfort while helping to maintain eye health. UltraHealth FC has the same advanced technology, aspheric, hybrid lens design of the upper vaults of the UltraHealth hybrid contact lens, but with flatter base curves starting at 35.50D. The variable-lift design combined with a vaulted fitting philosophy allows for clearance of corneal irregularities in corneas with oblate surfaces. Post surgical patients benefit from optimal ocular health with the 130 Dk GP and 84 Dk SiHy skirt that provides excellent oxygen permeability while the UV blocker protects from the sun’s harmful rays. GP optics are ideally centered by the SoftCushion™ soft skirt to support all-day, hassle-free wear. The soft lens-size makes them familiar to handle for patients and the active tear pump delivers fresh tears to minimize the need to remove lenses and refill with fresh saline. 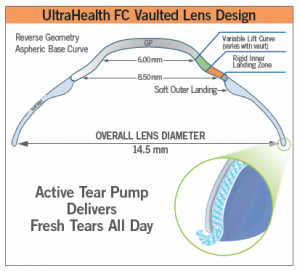 The active tear pump design also supports minimal dirt and debris entrapment and keeps the lenses from popping out. The UltraHealth FC lens is designed to provide an additional contact lens choice for post-surgical patients including post-radial keratotomy (RK), post-penetrating keratoplasty (PKP), and post-LASIK patients. The following three case studies are from a poster submitted and accepted by the 2015 Global Specialty Lens Symposium (GSLS) by Jordan L. Back, COA & Jessica M. Bezner, OD of Koffler Vision Group in Lexington, Kentucky. The poster is titled Case Studies Illustrating the UltraHealth FC Lens in Fitting Post-Surgical Ectasia1. These case studies illustrate the transformation of post-surgical patients’ vision with the new UltraHealth FC (flat curve) Lens Design. This new hybrid lens design improves centration, comfort and provides optimum oxygen transmission for ocular health. To address challenges such as fluctuating vision and poor lens comfort, ten post-surgical patients were fit with the UltraHealth FC lens. The participant pool consisted of patients seeking improvement with their current lenses. Ten participants were fit in the UltraHealth FC lens: seven were successful, and three are in progress. Initial lens selection was based on the recommended starting point: 255 microns of vault with a medium skirt. Adjustments were made per central clearance and skirt curve. All lenses were disinfected and stored in Clear Care solution. 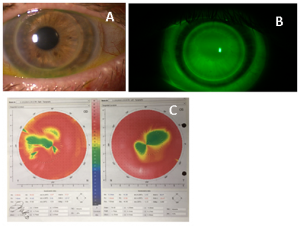 Patient 1, a 61-year-old, post-LASIK female, wearing post-surgical-design corneal RGPs, was refit due to heavily deposited lenses, fluctuating vision, and discomfort OU. The RGPs provided acuity of 20/30 OD and 20/25 OS. Keratometric (K) readings were 39.9/40.7x028 OD and 41.6/41.9x071 OS. Slit Lamp findings included map-dot-fingerprint dystrophy, 1+ superficial punctate keratitis and 3+ meibomian gland dysfunction (MGD), all of which were treated prior to the refit. Figure 1. 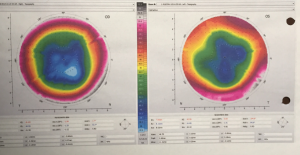 Case Study 1 patient’s corneal topography. The first UltraHealth FC diagnostic lens was successful. Parameters were: OD 255/flat skirt/-1.00, 20/20, and OS 255/flat skirt/-0.50, 20/20. This patient can now achieve 14-16 hours of comfortable lens wear and no longer experiences lens deposits due to successful management of the MGD. Patient 2, a 65-year-old female, presented with decreased vision and poor comfort with SynergEyes A lenses, which provided acuity of 20/40 OD and 20/50 OS. She underwent Radial Keratotomy (RK) OU ten years prior, leaving her with best spectacle correction of -1.00-0.75x038, 20/60 OD and -1.50-1.25x053, 20/60 OS. K readings were 40.9/41.6x004 OD and 41.6/42.5x155 OS. The cornea showed 8-incision RK and 2-incision AK (axial keratotomy) OU, and also mid-peripheral/junction bearing of the SynergEyes A lenses. 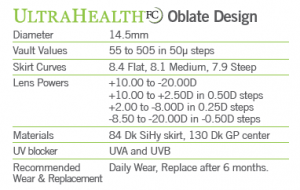 The UltraHealth FC lenses were fit diagnostically, and the following was ordered: OD 305/flat skirt/-2.00, and OS 255/flat skirt/+1.50, which improved acuity to 20/25 OU. She is able to wear the lens all day with satisfactory comfort. Figure 2. Case Study 2 patient’s corneal topography. Patient 3, a 78-year-old male, requested a new fit OS. He underwent PKP (penetrating keratoplasty) secondary to keratoconus in 1993 OS and 2001 OD. He was satisfied with a semi-scleral lens OD, but reported that he had been out of a lens OS “for years” due to multiple unsuccessful fitting attempts. Best spectacle correction OS was +2.00 -3.50 x 037, 20/40. K readings showed a large amount of cylinder: 41.0/47.8x130. The graft was clear on slit lamp exam OU. The UltraHealth (standard design) lens was tried first, Three lenses were unsuccessfully attempted due to heavy central pooling, ILZ bearing, and high corneal cylinder. Figure 3. (A) bearing at 2:00 and 8:00 on initial lens. (B) Vault increased by 50 microns for lens 2; resulted in air bubble. (C) Skirt steepened; resulted in excess pooling. 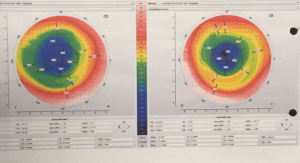 The UltraHealth FC lens was then introduced, and a successful fit accomplished by increasing the vault, which allowed the best fit over his corneal astigmatism. The following lens was ordered for OS: 355/flat skirt/+2.00, 20/25. The patient reports clear, comfortable vision for 12-14 hours per day. As of this conference, he has successfully worn this lens for ten months. Figure 4. (A) successful fit viewed with white light; note the clear PKP. (B) ideal UH FC fit. (C) this patient’s corneal topography. Extended parameters and flatter base curves with the UltraHealth FC design skillfully complement post-surgical ectasia following procedures like RK, LASIK, or PKP. Of the seven completed fits, seven were successful. The remaining three are still in progress. The hybrid lens design of the UltraHealth FC embodies ideal contact lens qualities: the soft skirt improves lens centration, as well as comfort. Oxygen transmissibility is optimum with the center GP at a hyper Dk value of 130, and the SiHy skirt at a high Dk value of 84. Furthermore, there is UVA and UVB protection. This is a 2nd generation SynergEyes lens, and improves comfort (e.g. Patient 2) due to a wider and more subtle ILZ of the GP compared to 1st generation lenses such as SynergEyes A. These traits, in addition to the ease of fitting the UltraHealth FC (simple modifications in vault or skirt, not base curve), make it a viable solution for post-surgical patients from both functional and practical standpoints.